Few hard rock bands are as widely respected yet criminally overlooked as King's X. The trio (bassist/vocalist Doug Pinnick, guitarist/vocalist Ty Tabor, and drummer/vocalist Jerry Gaskill) seemed destined for the big time with their irresistible blend of melodic Beatlesque harmonies, metallic riffing, and prog rock detours, yet for reasons unknown, never truly broke through to a mainstream audience. Pinnick (b. September 3, 1950) first met Gaskill (b. December 27, 1957) when the duo was touring with the Christian rock outfit Petra, and soon after, met up-and-coming guitarist Tabor (b. September 17, 1961). The trio joined forces in 1980 with the Top 40 cover band the Edge and thoroughly played the Missouri bar scene. By 1983, the band had changed their name to Sneak Preview and was now completely focusing on their original compositions -- resulting in an obscure and very hard to find self-titled debut album released around this time. Sneak Preview was offered a recording contract in 1985 if they relocated to Houston, TX, which they did, but the deal failed to materialize. Undeterred, the trio continued on and perfected their sound and songwriting further, catching a break when ZZ Top video producer Sam Taylor took the group under his wing, helping them secure a recording contract with New York's Megaforce label in 1987, and suggesting that they change their name to King's X (the name of a local outfit that Taylor was an admirer of back in his high school days). In 1988, King's X released their debut album, Out of the Silent Planet. Despite praise amongst critics, the public didn't know exactly what to make of the group's original and multi-genre encompassing style, and the album sank without a trace. But with their sophomore release, 1989's classic Gretchen Goes to Nebraska, a buzz began to develop around the band in the metal community, as members of Anthrax and Living Colour praised King's X in the press, and MTV granted a few airings of their anthemic track "Over My Head." The stage was set for the group's big breakthrough, and things appeared to be going according to plan when their third release, Faith Hope Love, surfaced in late 1990. The album just missed the U.S. Top 30 and nearly reached gold certification, due to landing a lengthy spot opening on AC/DC's sold out arena tour in both the states and Europe, while the Beatlesque "It's Love" received major airtime on MTV. What should have been an exciting time for the band quickly turned sour, however, as King's X began to experience trouble with manager Taylor. 1992's self-titled release (the group's first to appear on Atlantic Records without the Megaforce imprint) proved not to be as focused as their previous pair of albums, resulting in the album disappearing quickly from sight after release (and their ensuing tour halted), as they ended their relationship with Taylor. But it appeared as though the change had refueled the group's musical desire once again, as evidenced by the Brendan O'Brien-produced, stellar 1994 release, Dogman, which performed respectfully on the charts. This success resulted in the band opening shows for Pearl Jam and a show-stopping performance on the opening night of the mammoth Woodstock '94 festival. Atlantic Records began putting pressure on the trio to deliver a breakthrough hit but when 1996's Ear Candy failed to live up to expectations, King's X left the label (Atlantic would issue one more release from the band a year later, The Best Of, which featured 13 fan favorites, as well as three unreleased compositions and a live track). 1998 saw the group sign to the Metal Blade label, as both Pinnick and Tabor issued their first solo albums (Tabor with Moonflower Lane and Pinnick with Massive Grooves, the latter issued under the alias Poundhound), followed by the group's seventh studio release overall, Tapehead. Now free to issue albums at their own pace, the group issued two more albums only a year apart -- 2000's Please Come Home...Mr. Bulbous and 2001's Manic Moonlight. Pinnick continued his solo career in conjunction to King's X, issuing Poundhound's second release, Pineappleskunk, the same year (as well as forming a side-project with former members of Trouble, dubbed Supershine), while Tabor issued two albums with the prog metal supergroup Platypus -- 1998's When Pus Comes to Shove and 2000's Ice Cycles. 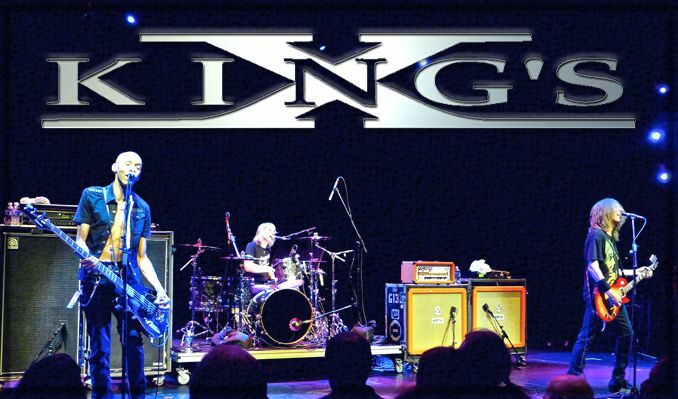 Around the same time, King's X received a pleasant accolade from their peers when they were voted as one of the "100 Greatest Artists of Hard Rock" on a VH1 TV special. In 2003, the band released Black Like Sunday, a collection of re-recorded songs from early in their career that had previously only existed as demos or bootlegs. Their first concert album, Live All Over the Place, arrived the following year, followed by their eleventh studio recording, Ogre Tones, in 2005.